Nestled on the gentle hillside of a sleepy hamlet, this lovingly restored home and garden artfully unites original character with up-to-date facilities. Set in a rural idyll teeming with wildlife, it has beautiful views onto woodland & unspoilt countryside. This 'maison de campagne' was little more than a pile of stones, when Francis & Alison and their team of local artisans started restoration work. Reconstructed using the existing stones and oak beams and subsequently furnished with reclaimed, hand painted furniture and 'objets trouvés', this place is a testament to the ethics of recycling. The thick stone walls combined with cool terracotta floor tiles maintain a natural coolness in the Summer negating the need for air conditioning. Natural fabrics and linens frame the windows and doors with refreshing simplicity. The house faces south and its front borders are planted with old fashioned, scented climbing roses and lavenders. The garden is walled to one side with iron entrance gates and a gravel driveway to the parking area. There is a sunken herb garden inspired by the Carolingian gardens of the region and a wonderful view from the lawn over the meadow, which is occasionally grazed by a few sheep and a couple of cows. The shady open barn, planted with wisteria and clematis, under which is a large wooden table & chairs and along with the barbecue, makes a perfect setting for outdoor eating & drinking. 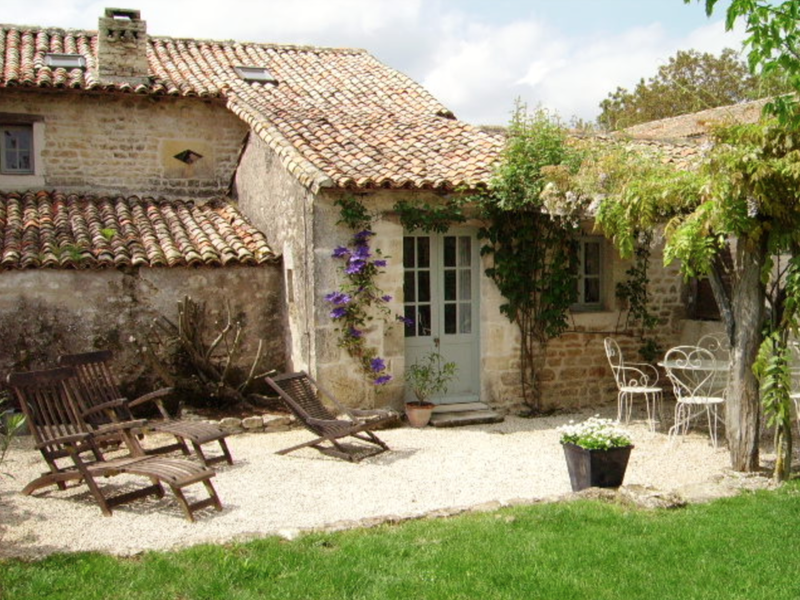 The tiny hamlet of Le Sauvage, just metres away from the Charente / Deux-Sèvres border, is perched on a hillside and surrounded by pasture, fields of sunflowers in the summer and groves of magnificent sweet chestnut trees. The hamlet, which means ‘untamed’, with its honey coloured stone walls and canal roof tiles, seems to sleep and shimmer in the heat of the day. It’s an ideal area for walking and gentle cycling, especially as there’s so little traffic on the roads, lots of interconnecting lanes through fields and woodland, forgotten hamlets, stone lavoirs (ancient washhouses) which bubble with ice cold spring water, wells … lovely spots for picnics. If you don’t feel like stirring out of the garden, you could stay at home and enjoy your private pool or simply watch the migratory hoopoes or later on in the evening listen to the song of the nightingale. There’s a wealth of good local restaurants offering excellent value, or dine on freshly cooked local produce 'at home' under the stars. Special rates for couples £795 per week in October 2018 & May 2019. Long Winter Lets available from early November to late March from £275 per week. Please do enquire with us even if our availability calendar shows fully booked as we’re delighted to propose 'Manoir de Plaisance'.